I would like to introduce to you author June Spears. 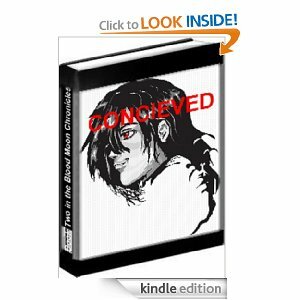 She is a new up and coming Indie author of The Blood Moon Chronicles (4 books) First is Concieved, followed by Bitter Sweet, Reunited and Imprinted. Look out for the fifth book to the series called Goodbye. Thank you June for allowing me to spotlight you on my blog. It's always nice to meet new fellow Indie authors and get to know them more. 10. How do you pick your books? I read a wide range of books, usually depends on my mood. 11. Advice for other authors? Get your work out there, you never know how good you are till you try. 13. Where do you write? I have to write late nights when my baby is sleeping cause I'm a full time worker and mom by day. 17. If you were deserted on an island, who are 3 famous people you would want with you? Einstein (to work to get us off) Taylor Launer ( to keep me company) and my daughter cause I can't go without her. 18. Of your characters, which one would you say is most like you and why? "Zelenia" she is based off of my childhood. 19. What made you want to be a writer? It just came to me one day. I sat down at the computer and in a months time I had written 6 Novelettes. 22. What is the one thing you never go without? Isabella, My daughter - That's my oldest daughter's name! 23. Your biggest influence? Hilary Clinton, She inspires me. 25. A great blog you would like to recommend for others to discover? http://authoradduling.blogspot.com/ - aww shucks! Thanks June! Thanks for dropping in and getting to know author June Spears! Don't forget to click my link "giveaways" above and enter to win a great kindle copy of one of these great reads: Of Posideon, Sweet Evil and Hemlock!